This is a 2 hour non-stop power yoga flow that will uplift and inspire you to find new ways to get into poses and out of your head! It’s a fun, creative, and in-the-moment way to transition into your weekend. We will build the foundation for several arm balances including crow, side crow, and 8 angle pose. Feel free to send any request poses for the class to LA at LA@lafinfinger.com. Pre-registration required for this special class. This 90 minute practice is designed to enable students to find ways to check their head as well as ease into their afternoon as they set up restorative and nourishing poses. This practice will ground students and enable the nervous system to relax. An inspired power yoga practice led by Pittsburgh-based yoga teachers LA Finfinger and Stacey Vespaziani are teaming up for an inspired power yoga practice in the lobby of the Andy Warhol Museum and set to creative beats of DJ Hyfi. This electric, two-hour yoga class will be held from 7-9p.m. 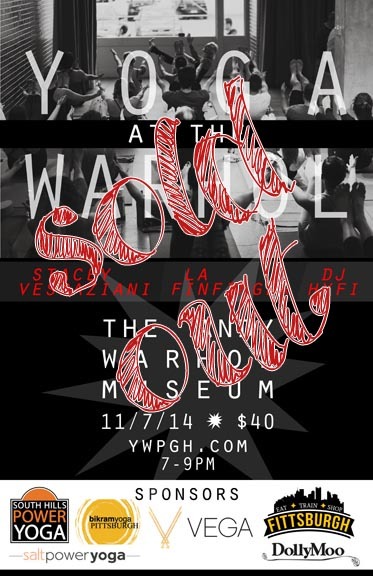 on Friday, November 7, 2014 at the Andy Warhol Museum (117 Sandusky Street, Pittsburgh, PA 15212). Ten cans of Campbell’s Tomato Soup will be donated to the Greater Pittsburgh Community Food Bank for every ticket sold. Participants should plan to bring their own yoga mat, towel and water. 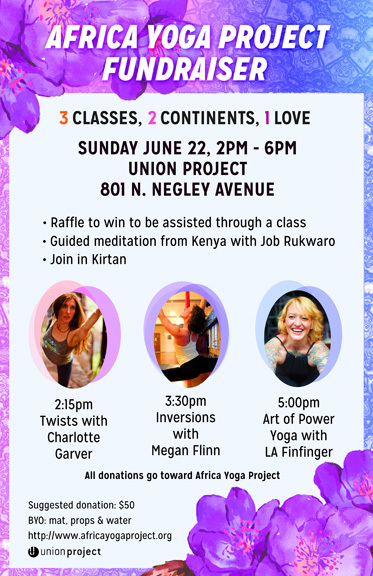 Sunday, June 22nd at the Union Project from 2PM – 6PM. See the poster for details. Friday, Jun 6, 2014 at 6:00 pm – 7:30 pm at Yoga Soul in Princeton Junction, NJ. 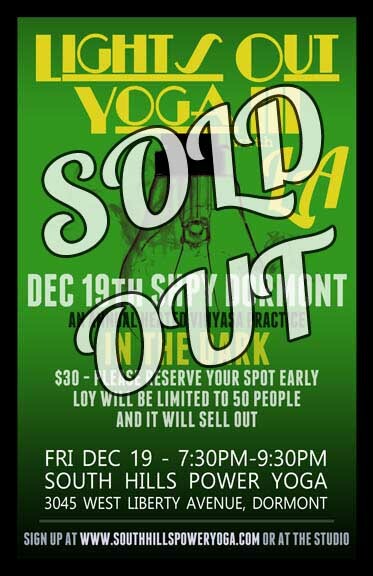 LA will lead a 90 minute gently heated vinyasa practice in the dark. Your practice will be challenged in new ways and your senses heightened with this yoga class. This practice is recommended to students with an existing vinyasa yoga practice. LA will be teaching a All Levels class at Hotbox Yoga in Manayunk, PA 9:30 – 10:45AM on Sunday, June 8th. As yoga teachers – we get to help people move, breathe, and find space on their mats. As part of the larger yoga community – we get to knit together to raise money through our work when we’re in need. My friend, fellow yoga teacher, and lululemon ambassador Todd Lavictoire needs our help. 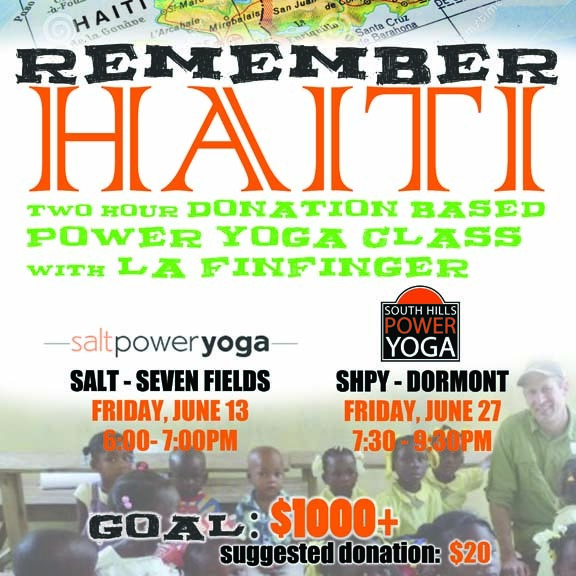 Why: LA met an incredible CrossFit Coach, Frank Wray, of KW CrossFit in Cincinnati and wants our yoga community to help fund his dream of raising money to build a school and community center in northern Haiti. $25 in advance or $30 the day of.